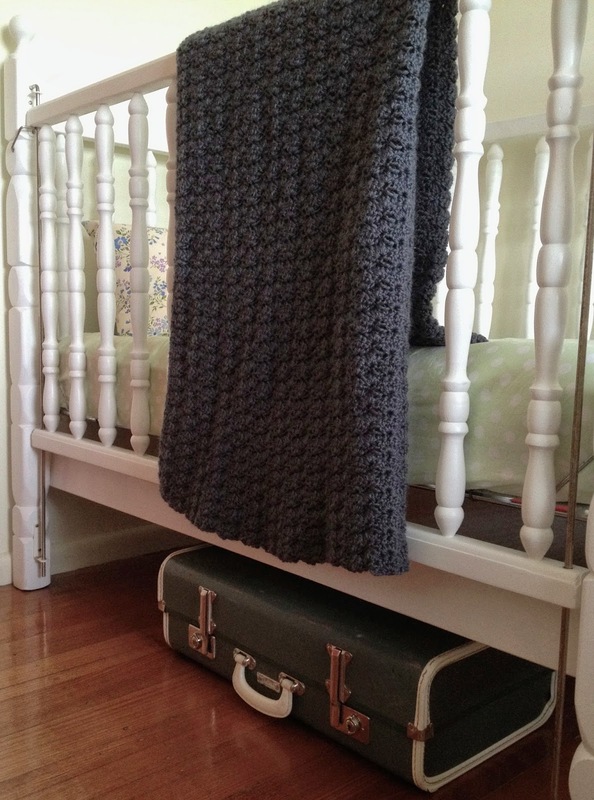 loved handmade: a blanket for olive.. I'm terribly impatient. I really wanted to use the big camera to get some nice shots of this completed project, but its out earning us a living and I can't wait any longer! So excuse my iPhone pics. 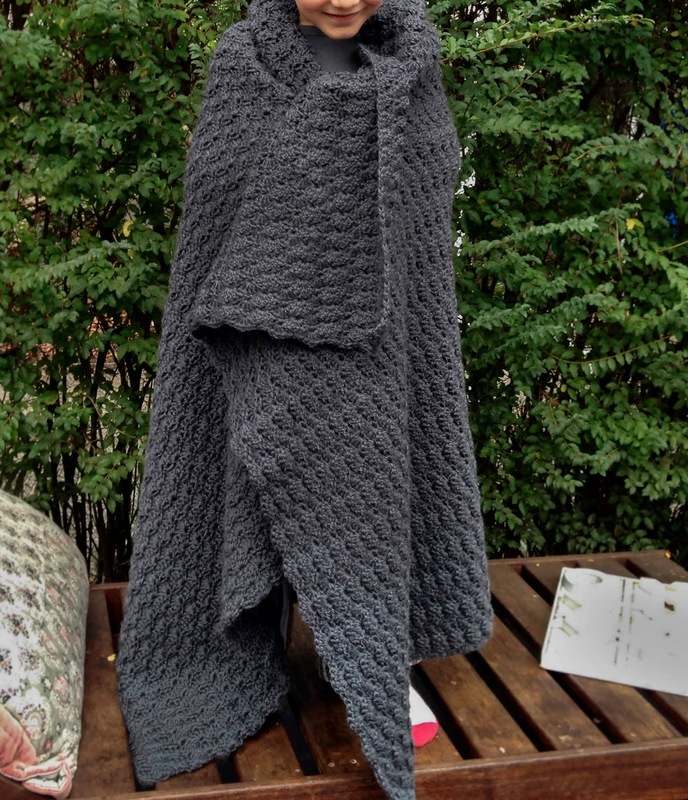 This blanket right here, in all its gloriousness, was my #everydayinmay project and I can't even believe myself that I finished it inside a month. I am so pleased with the way it turned out. Initially, I was a bit concerned the shell stitch might have been too much on such a large scale, but no, its pretty fabulous. My plan was to make a cot size baby blanket, but it seems I purchased too much wool and just had to use it all up anyway. It's probably more suited to a single bed, or the couch, or if this boy has anything to do with it, permanently wrapped around him! As its quite a dense stitch, I used a larger hook, 7mm, to give it a bit more drape, which worked beautifully but I think I could have gone even larger, perhaps a 9mm or even 10mm. The trouble with finishing a project you have thoroughly enjoyed working on, is that as much as you can't wait to see it complete, you don't want it to end, a bit like a good book. Fortunately, we have some new babies being born this year, so I plan to get busy on some more of these as gifts, I can't stop! Thanks so much, Catherine. I have two other blankets that have been waiting to be finished for a very long time, so I'm a bit blown away that this one is actually complete! It is beautiful! Well done. Absolutely marvellous!!!! Love the texture, the stitch, the size....everything! Simply gorgeous! Wow, that's beautiful, love both the colour and the stitch. So magnificent ... Baby olive is a lucky girl & will treasure this forever! Oh Mel, its gorgeous. I LOVE making blankets, there is something so therapeutic and calming about the repetitive stitches and the backwards and forwards, backwards and forwards. I love the colour you chose too. I have just been working on a blanket that has worked up so quickly I've just about done it in a week.. So beautiful Mel. The colour and shape and size. I'm with your boy.....I'd be trying to secure for myself as well.